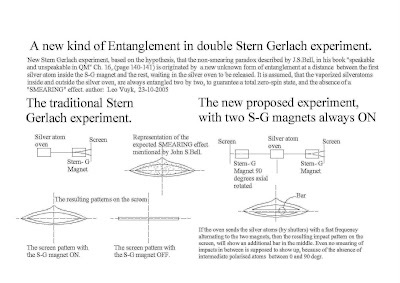 A DOUBLE MAGNET Stern Gerlach based experiment to support the new multiparticle entanglement system supposed to be active between vaporized silver atoms. The difference between the up and down atom in the Stern Gerlach experiment. 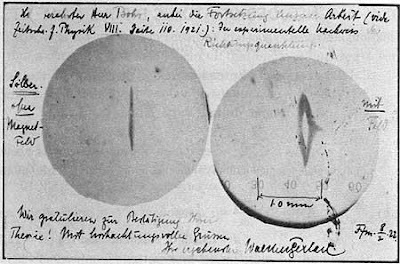 The original experimental result, printed on Gerlach's postcard to Niels Bohr dated Febr. 8-1922. Proposal for a new DOUBLE MAGNET Stern Gerlach experiment to show howthe first vaporized silver atom, measured inside the S_G magnet, ismanipulating the polarization of the rest of the vaporized silveratoms coming in, to be measured in the same S_G magnet.It was John S. Bell who described an unresolved problem connected tothe well known STERN-GERLACH MAGNET experiment, one of the basicexperiments of all Quantum Mechanics.He described the so called "lack of smearing" of the silver atoms onthe screen as crucial and unresolved.He argued that the non polarized atom coming into the S-G magnetshould all have a different curved pathway into the direction of thescreen, which should result into a smeared profile of silver atom-dots on the screen, which isnot the case!Until now I have not experienced a reasonable logic explanation forthis problem in the literature.However if we assume that the first particle which is measured by the magnet, influences the polarisation of the next particles by a non-local guiding entanglement system, then what could be called "multi-particle entanglement" comes here into play.Then there is a possibility for a delicate TEST which could resolve the problem and be a firm support for so called “non-local hidden variables” because all the next incoming particles have a “hidden” polarisation up or down before coming into the magnet. THE QUANTUM MECHANICAL UNIVERSE SEEMS TO BE ABLE TO MIMIC ALL THE EXPERIMENTAL EFFECTS OF GENERAL RELATIVITY. Quantum microstructure. Consequently: Particle Form, Higgs-vacuum oscillations and "Entanglement" at several scales, are the three major elements for this new view on reality. "Mimicking Relativity" means that the search for small anomalies in local lightspeed and ZPE (zero point energy) lensing effects around Black holes, or Large scale Casimir effects, will be of highest importance. The origin must be that the big bang could be compared with the “splitting” of the colossal Big Crunch black hole, as remnant of the raspberry shaped cyclic multiverse. First, a small intorduction on Galaxies inthe early universe. Fractal spacetime foam and the CPT symmetric universe. The multiverse in its point symmetric raspberry shape is contracting as a whole instead of expanding! The idea of expansion is supposed to be based on the false interpretation of Hubble redshift increase with distance. Hubble redshift should only be interpreted as the result of Space deformation by the consumption of Higgs space by Dark Matter: the network of massive black holes located around Galaxies and smaller black holes INSIDE galaxies. Recent astronomical research did show us, that several (31) galaxy clusters do not produce a so called CMB radiation shadow!! 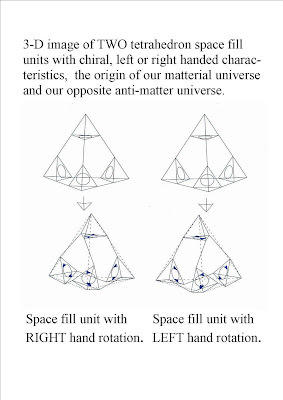 .Reference: Lieu, Mittaz and Shuang-Nan Zhang, UAH, "The Sunyaev-Zel'dovich effect in a sample of 31 clusters: A comparison between the X-ray predicted and WMAP observed decrement,"
Two anomalous observations, support the raspberry (world egg) multiverse hypothesis. "A controversial claim by Laura Mersini-Houghton is that it could be the imprint of another universe beyond our own, caused by quantum entanglement between universes before they were separated by cosmic inflation. 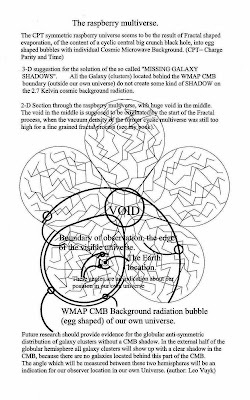 Laura Mersini-Houghton said, "Standard cosmology cannot explain such a giant cosmic hole" and made the remarkable hypothesis that the WMAP cold spot is "… the unmistakable imprint of another universe beyond the edge of our own." If true this provides the first empirical evidence for a parallel universe (though theoretical models of parallel universes existed previously). It would also support string theory. The team claims there are testable consequences for its theory. " At the same time there seems to be a HUGE VOID in the "Early universe". The topology of a "raspberry universe"could solve the puzzle, see above. The creation of our material universe. To create a material universe, we need a symmetry breaking system. Mainstream physics tells us that symmetry breaking after the big bang, was based on a huge anti-symmetrical annihilation process leaving the material universe behind. How this should work is even to day not well understood. The new chiral Model.According to this new physics model, electrons and positrons (in fact all fermions) have a rigid propeller microstructure, propelled by the oscillating Higgs vacuum, which is supposed to have a "chiral" lattice structure. This makes that electrons prefer less than positrons to merge with Gluons/Photons to become a Quark. Just that simple could nature be. If electrons and positrons are able to merge with photons into compound quarks, then it is clearly not needed to start the big bang with a huge annihilation process, because then we only need a "chiral" vacuum with a right- or left handed spiral structure..
A second support for a chiral vacuum lattice in our Universe, is that it solves a long standing mystery why Amino acids on Earth but also in space (in Astroids), are preferentially left handed. 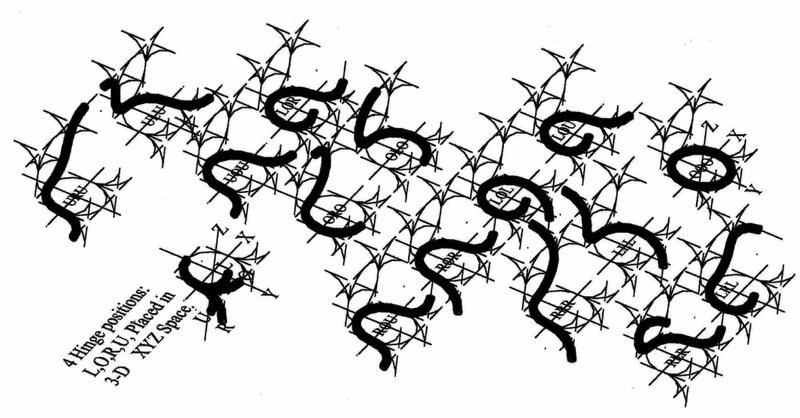 One of the most simple example for a basic building block of the vacuum lattice, ( fractal spacetime foam on Planckian scales (coined by Renate Loll)) you will find below. 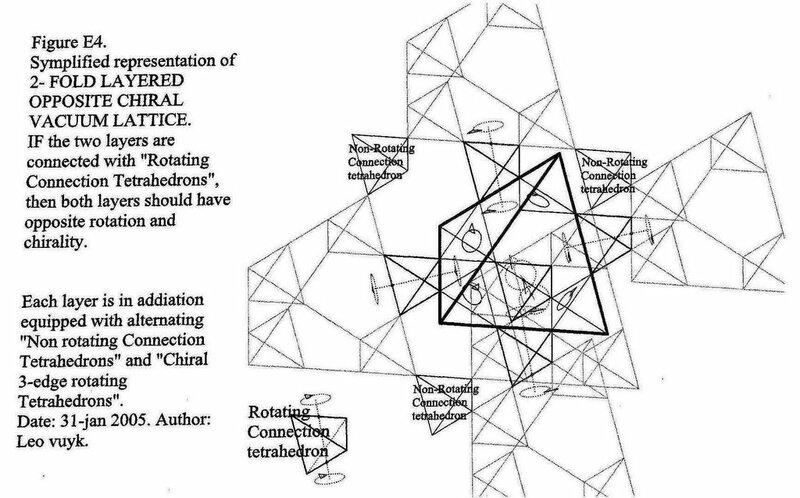 The three outer edges of the compound tetrahedrons are all able to make a full 360 degr. spiral in axial direction. They have a srew-like or helical structure. The need for a chiral vacuum, to be the base for a material and anti-material raspberry shaped cyclic multiverse. Example for Raspberry shaped CPT entangled universes ( the multiverse) . 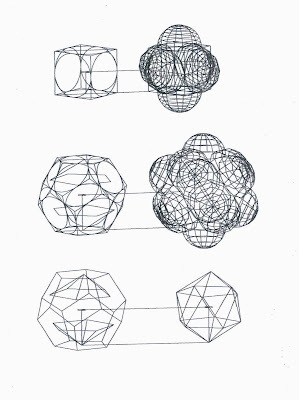 If there are 6 universes, ( the cubic model below) there will remain only a small "void" in the middle. 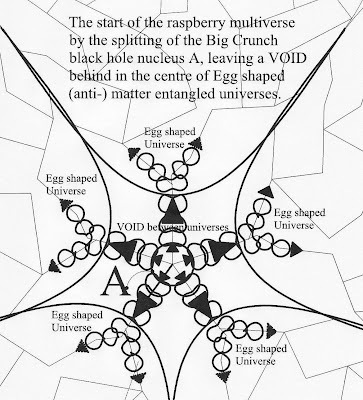 If there are 12 entangled universes in a "Raspberry configuration" then a "huge void" will be possible in the middle. A new system to explain the existence of DARK MATTER and DARK ENERGY. IF the vacuum is crowded with a super dense crystalline Lattice of oscillating Higgs particles and IF Black hole nuclei are crowded with tightly packed real and flexible Higgs particles each with a certain bow tension, THEN we may expect a causal Big Bang of an evaporating Big Crunch Black hole. 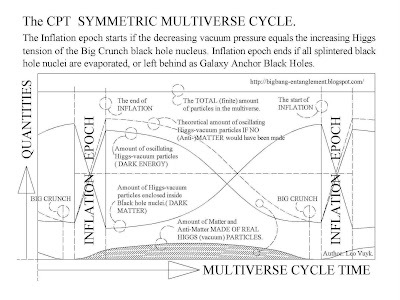 The Inflation starts if the decreasing vacuum pressure on the outside of the Big Crunch nucleus, originated by oscillating and attracted Higgs particles, equals the increasing Higgs particle tension, originated by the mutual bow tension of the increasing number of Higgs particles hidden inside the Big crunch Black hole nucleus. All these evaporated particles are supposed to have 4-8-10- 12 multi entangled –anti-particle counterparts able to form equal numbers of separated entangled copy universes in RASPBERRY shape “at a long distance”. After contraction, the universe will rebound and begin expanding again - the ultimate in cosmic recycling. 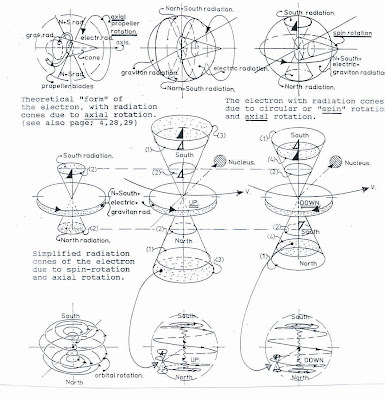 The Cyclic CPT symmetric bouncing Universe is a Multiverse!. The free lunch that made our universe. Astronomers had yet to demonstrate that there was enough dark matter to stop the universe expanding forever, but we theorists were confident that our universe was flat. The key point, however, is that with zero total energy, Aquinas's puzzle is resolvable. And once the energy fluctuations of quantum mechanics are thrown into the mix, the idea of something arising from nothing can become not just possible, but necessary. Purists will argue that this begs the question of how the physical laws that make it all possible arose. Nevertheless, science has once again altered the playing field for such metaphysical speculations in a dramatic and beautiful way. Occam's principle states that the explanation of any phenomenon should make as few assumptions as possible, eliminating those assumptions that make no difference in the observable predictions of the explanatory hypothesis or theory. Does the former multiverse idea including entangled copy universes correspond with this Occam's principle? YES, because we need to assume the existence of CPT POINT-symmetry in the universe, and all other new physics inventions presented in this book, if we want to explain our world and all the (small) anomalies, in a non-mathematical way, as is presented further in this book. Lee Smolin's book "The Trouble with Physics" analyzes the present problems in theoretical physics. "How unusual is it for three decades to pass without major progress in fundamental physics? 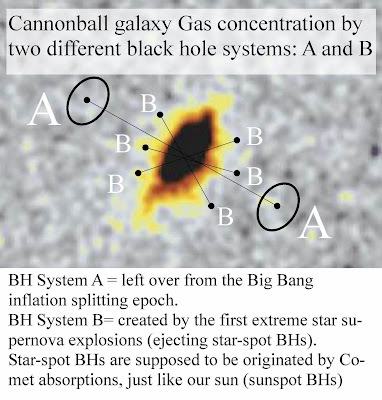 In this web blog, the result based on logic combination of experimental evidence and cosmological observation, is that a different CPT (Charge Parity and Time) symmetric oscillating Multiverse emerges out of an evaporating Black hole Big Bang with a natural INFLATION TIME. This Multiverse is expanding and contracting at the same time ending up into a Big Crunch as the beginning of a new cycle. Galaxies are accelerated out of the centre, but the finite vacuum is contracting, it is "eaten" by the increasing number of Black holes.Probably all Black holes are equipped with a Fermion repelling horizon and the origin of Dark matter. A super-dense oscillating Higgs particle vacuum, seems to be the origin of an enormous amount of Dark Energy, accelerating Galaxies but also accelerating star formation by Black hole vacuum energy lensing effects. 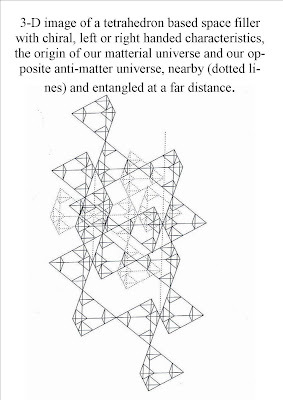 As a consequence, the Quantum mechanical universe is abe to mimic relativity in a very complex way, Fermion propellers and even photons are guided by entanglement between universes..
As a result you will find in this book traces of possible solutions for Lee Smolin’s list of the five big problems in physics. 2: Resolve the problems in the foundations of quantum mechanics or find another one that does make sense. 3. How can we explain the various particles and forces as the manifestations of a single fundamental entity. 4. Explain how the free constants in the standard model of particle physics are chosen in nature. HIGGS PARTICLES, (Dark Energy) are supposed to have a specific FORM able to change shape by collision and to be the origin of all other particles (the God particle). Thus Fermions and Photons/Gluons/Neutrinos have also real rigid different forms. Higgs particles are supposed to oscillate with a Universal defined constant frequency along a Three-Dimensional shaped network of tetrahedral shaped lattices with the Planck length (and variable length around black holes) . All Higgs particles oscillate with the same cycle through the universe but with variable speed dependent of the vacuum lattice length. The lattice length is forced to vary in the neighborhood of black holes due to the absorption of the vacuum lattice including the Higgs particles around black holes, leading to light path curvation. FERMIONS are form-changed Higgs particles supposed to have a real propeller shape and are able to become a double spin state by Higgs scattering by oscillations. These Higgs oscillations are coming in from directions according to the so called oscillating vacuum lattice, which is tetrahedral in its basic form. The Higgs scattering process with Fermions produce Photons (called Gluons on short- Quark related-range) of different Form (5 types: Gravitons, two magnetic and two electric (monopole) Photon/Gluons). Fermions have the ability to merge or “click on” with the non-propeller shaped Photon/Gluons, to produce Quarks. Fermions are supposed to spin outside the vacuum lattice but are energized and driven to spin, by the continuous scattering with the Higgs particles. Each collision with a Fermion does change one real Higgs into a Higgs particle with a particular photon quality depending on the angle of scattering attack of the Higgs to the Fermion. Thus the spin and "eigen energy" of the Fermion is supposed to come from the scattering of the Higgs field. The Black hole is supposed to be a particle graveyard with a real particle nucleus containing real particles, which are densely packed together by the Higgs vacuum scattering pressure from outside. The black hole is not able to emit graviton or other photonic information outside the horizon, because the Higgs vacuum lattice being the transport medium for Photons, is absorbed by the black hole nucleus itself. This could be called a constant Casimir pressure on the black hole nucleus. As a result, the Black hole has a “Light horizon” with a radius depending on the number of nuclear Higgs particles. BLACK HOLES HAVE NO MASS. Nothing is supposed to spin by Higgs scattering inside the Black hole nucleus. 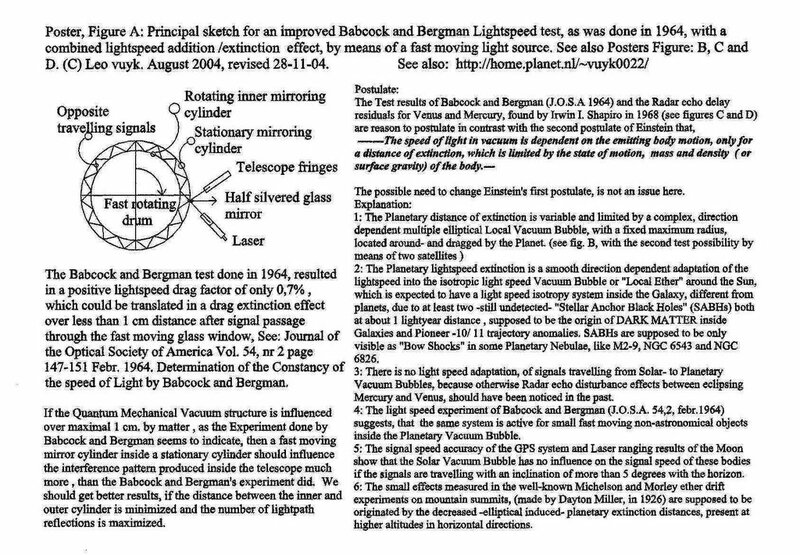 Micro black holes are supposed to act as Ball lightning, Comet nuclei, Sunspots, Herbig Haro objects. It is assumed that due to the strong curvature of the micro Black hole horizon pair production and even Quark production takes place, even able to produce complete atoms like Hydroxyl found around Comet nuclei. PHOTONS, are oscillating Higgs particles with a photon memory able to transfer this photon memory with the local speed of light. The vacuum is a ultra dense energetic oscillating lattice of REAL Higgs particles, which are able to transport photon information like graviton-, electric,- magnetic and etc. etc along the lattice. There is no need that the REAL form of the Higgs particle during Photon transportation through the vacuum is transformed into the real photonic shape. ONLY at the moment of scattering with Fermions the shape of the Higgs particle should change into the real photonic shape to be able to transfer a force by scattering or by merging (e.g. Gluons). Thus each Higgs particle should have a Photonic memory. HIGGS IMPULSE VECTOR HEDGEHOG. Despite the triangular form of the vacuum lattice on average we may assume that the Higgs oscillations have a random globular impulse on a Fermion. This can be made visible by a globular set of impulse vectors around the Fermion coined impulse Hedgehog. However if some Higgs particles are programmed as a photon, then the impulse Hedgehog changes and will transfer a one sided force on the Fermion (e.g. gravity, magnetic-or electric forces, push or pull forces). MASS is the variable (variable by Lorentz-transformation) capacity of real spinning Fermions, to change real scattering Higgs particles into the same number of Higgs-Graviton-Photon particles with a specific graviton memory. MOTION, (through the oscillating vacuum lattice frame) is the (Lorentz-transformed) capacity of real spinning Fermions, to change scattering Higgs particles into as much Higgs/Photon particles in all directions but in NON-equal numbers around the spin polarized Fermion. The spin polarization of the Fermion relative to the vacuum lattice is supposed to be the origin of polarized emission of gravitons and also the origin of real mass increase and length contraction of atoms. QUANTUM GRAVITY, is the balancing result between the impulse differences of Higgs and Higgs-Graviton photonic scattering on spinning Fermions. If represented as a non-globular impulse vector field around the Fermion we could call this a anti-symmetrical Gravity Hedgehog.